Save space and increase throughput. 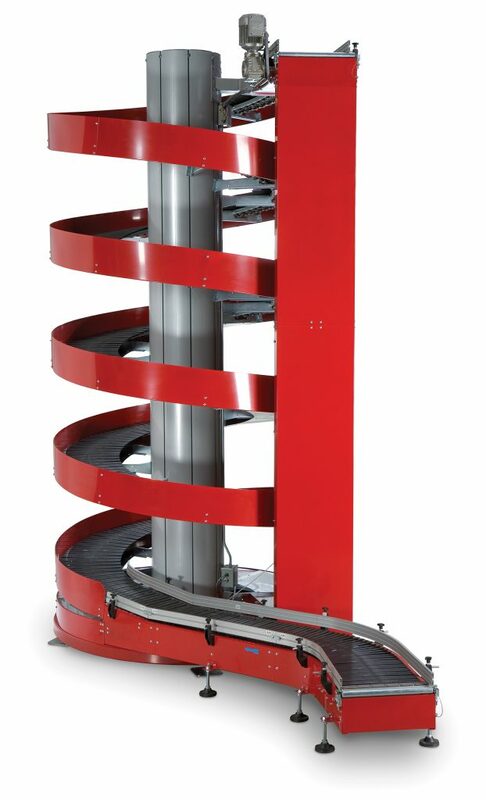 The Ryson Spiral Conveyors need less floor space than conventional conveyors and are faster and more reliable than any elevator or lift. The Ryson Unit Load Spiral Conveyors can convey cartons, cases, trays, totes and all sorts of packaged goods up or down in a continuous flow. Central to our design is the Ryson proprietary slat-style belts designed with rolling friction without any sliding movements or wear strips. This facillitates a small footprint, high speed, low noise, low maintenance and a long life. Ryson Spirals are available in powder coated carbon steel, stainless steel, hybrid and freezer versions. For installation examples and other articles about the Ryson Unit Load, or Case Spiral, check out the Ryson Weekly Blog. 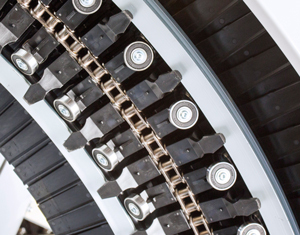 The spiral conveyor diameter is determined by the size of the loads (length, width and height) to be handled. 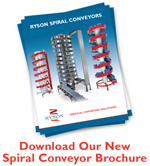 A broad range of sizes makes the Ryson Spiral Conveyors to be viable in the manufacturing, packaging, bottling, order picking, distribution, and warehousing operations of most industries. The slats are made of a fiberglass reinforced nylon composite and are available in widths of 8″, 12″, 16″, 20″, 26″ and 30″. The slats can also be furnished with friction inserts when additional grip is required.